Cat Trees and towers enable your pet to express all their natural instincts to climb, play, scratch and explore. If your cat is bored and inactive they may be more likely to fuss and play up, or develop other behavioural problems. Plus they may be more at risk of becoming overweight, with all the associated health problems that can bring. So by providing your kitty with a good quality, exciting cat tower or tree, you can help to ensure they stay active, healthy and entertained. 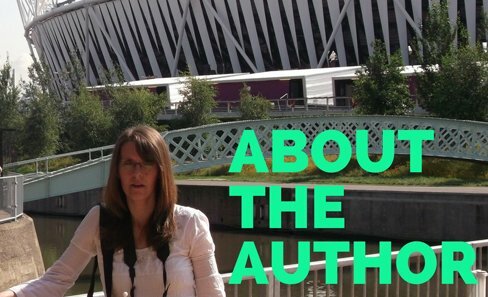 There are so many different designs available these days but many tend to look a bit the same. Would you prefer something a bit different or a design that compliments your home? I love finding good quality items that fulfil their function well but that also stand out from the crowd! So I thought I would show you my favourite choices of kitty trees and towers here. Cat towers aren't generally known for being attractive pieces of furniture, but as soon as I saw this one I thought it looked absolutely stunning! As eye catching and elegant as a modern piece of sculpture, it will add interest to any home and certainly get your friends talking when they come to visit you and your kitties! This beautiful piece of craftsmanship is made in sturdy plywood and comes in a choice of four colours. It has carpetted shelves for comfort and I love the gracefully curving shape. I also like the discreetly placed scratching mat and the hide-a-way pet box that forms the base. So if you love modern design and want something that will match your contemporary home interior, then this sleek and stylish cat tower is what you are looking for! Wow! 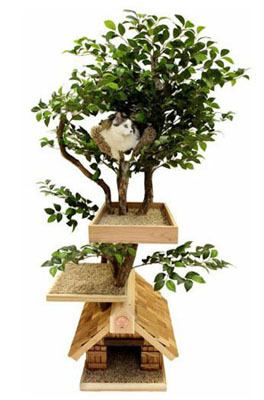 Can you imagine how excited your kitty will be climbing and playing in this life-like tree? It's made from real branches, which means it has a pleasant scent of cedar wood that your feline friend will really enjoy. It also makes a great natural cat scratching post too! The leaves are silk which will move and rustle as your kitty explores, adding to their stimulation and excitement. Every tree is unique and hand made in the U.S.A. They even come with a medallion on the front that you can have personalized with the name of your feline friend. I think this would look simply amazing in a conservatory, don't you? So why not bring the outdoors inside with this individually hand crafted piece of cat furniture! This cat tower was apparently featured on the Martha Stewart show! It's a great choice if you are looking for something eco-friendly as it is made from 100% natural materials and is 95% biodegradable. And being handcrafted from natural wood means that each one is completely unique! 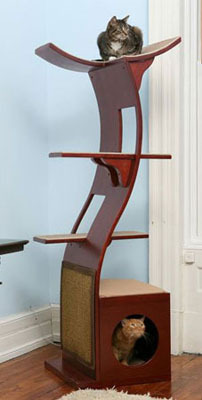 Your cat will love stretching and scratching to wear down their claws on the aromatic red cedar wood. Or climbing up to the cute basket perched on the very top! So if you like your kitty to be all natural, then take a closer look at these beautiful One-of-a-Kind Cedar Cat Trees. Well I hope you agree that there are some really great and exciting designs of cat trees and towers out there and good luck with finding the right one for your kitty!